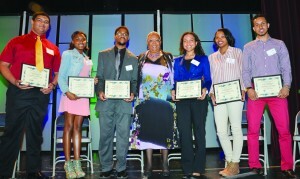 On Tuesday, May 7, the Minnesota Spokesman-Recorder (MSR) newspaper sponsored its 19th Annual Graduation Celebration to acknowledge African and African American senior students finishing high school. This year’s event was held at Sabathani Community Center in South Minneapolis. Scholarship winners (l-r) Evan Beto, Kayla Wright, Tour’e Walter Gates, MSR Publisher and CEO Tracey Williams-Dillard, Cara Claflin, Devyn Smith and Mohamed Malim. Shed G, co-host of The KMOJ Radio Morning Show, emceed the event, which awarded six graduates Cecil E. Newman Scholarships and two graduates Launa Q. Newman scholarships. Cecil Newman is the founder of MSR; his wife, Launa Q. Newman, carried on as publisher after her husband’s death. The food served was home style, with many in attendance returning for seconds. Keynote speaker University of St. Thomas School of Law Professor Nekima Levy-Pounds addressed the importance of this generation taking up the baton of social and economic justice and running hard with it, as there remains much work to be done.